Rogue One Director Gareth Edwards has creatively crafted an adult Star Wars story, for all those who remain young at heart and loyal to the original George Lucas creation. On their behalf, he has taken the entertainment culture they all know and love so well, and re-gifted it to the generations that have followed. Disney did a deal with Lucasfilm in 2012 with an aim of expanding its universe. A visionary, George Lucas produced his extraordinary Star Wars trilogy 1977 – 1983 by making models of the many different spacecraft he imagined and shooting the action against blue screens using actors wearing make up and absolutely fabulous costumes. He then invented the technology along the way to make it all work in the vastness of the universe. Luke Skywalker (Mark Hamill), Princess Leia (Carrie Fisher) and Han Solo (Harrison Ford) TM & © Lucasfilm Ltd. 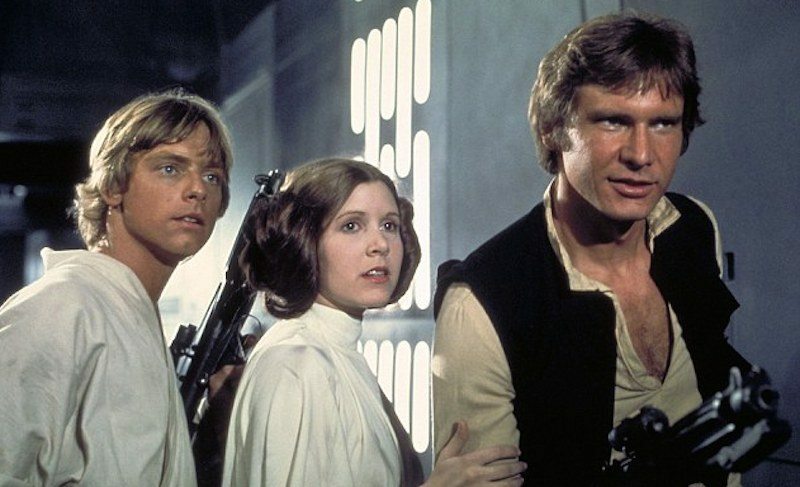 In Star Wars Episode IV A New Hope (1977) he introduced endearing characters; former Jedi Knight Obi One Kanobi (Alec Guiness) his protégé Luke Skywalker (Mark Hamill), the dashing galaxy trader Hans Solo (Harrison Ford) and his sidekick Chewbacca (Peter Mayehew) as well as Princess Leia (Carrie Fisher) and droids C2-PO and R2-D2. We also learned about The Force, which surrounds us in nature and drives the human spirit, which was strong in both Luke and Leia. Lucas changed the world of entertainment dramatically and helped advance technology quickly. Nothing like it had ever happened before and Star Wars Episode IV became a game changer beyond everyone in the entertainment industry’s wildest dreams, and much larger than anyone else’s imagination at the time. 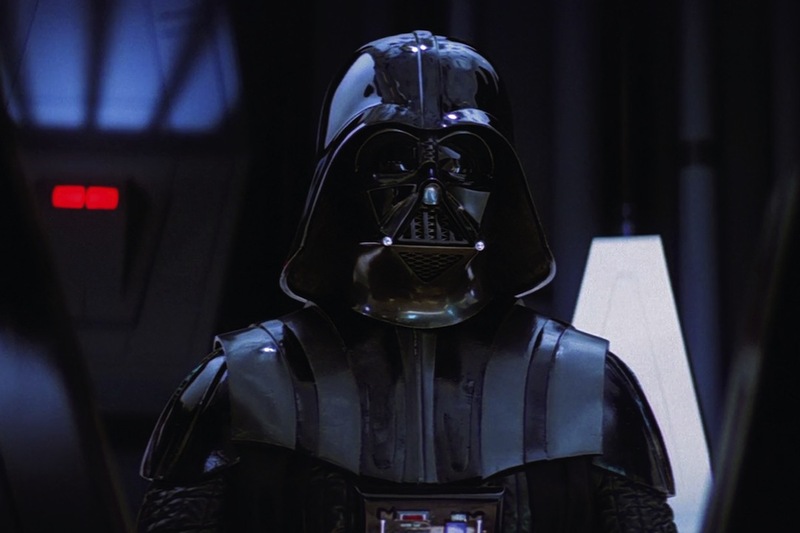 Darth Vader (Voice James Earl Jones), TM & © Lucasfilm Ltd. He gave us the galaxy to explore and his original heroes foiled the evil Darth Vader (voiced by James Earl Jones) and played a part in destroying the Death Star, a giant space station that could destroy a planet, which had been built by the evil Empire. We understood many had died before the layout plans to the Death Star were transferred into the memory banks of R2-D2, who together with his gilded counterpart C3-PO, escaped the clutches of the Empire, by blasting into space in an escape pod to land on the planet Tantooine, where our life following their adventures began. 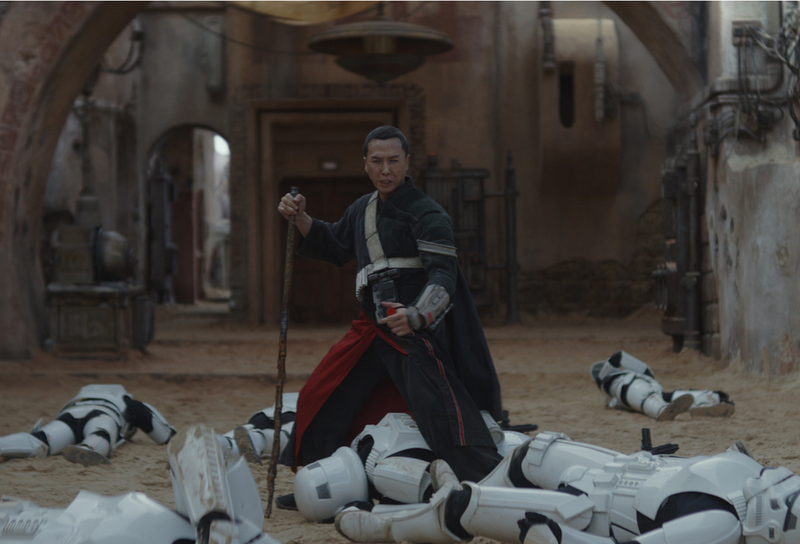 Last year’s modern re-boot Star Wars: The Force Awakens had us all on the edge of our seats while eagerly looking forward to this movie sidebar, which acts as a prequel to where the first movie started. Grand Moff Tarkin (Peter Cushing) TM & © Lucasfilm Ltd.
From its first moments Rogue One is like a spot the tie-in moment to the original movie. This happens today due to the brilliance of Computer Generated Imagery (CGI). Many of the original characters from the 1977 film are on board, despite their original actors being very old, or having already moved on to shine brightly in the firmament above. 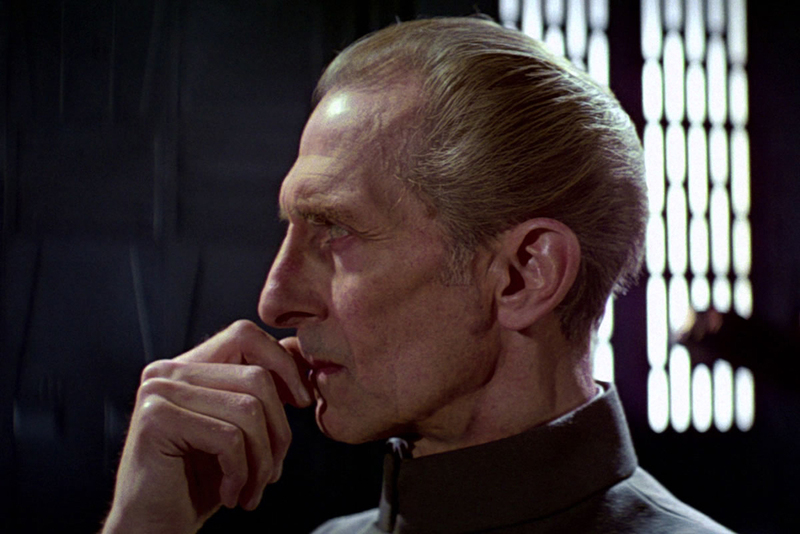 A list of new actors stand in for characters from the first film, including British actor Guy Henry (Harry Potter 1 & 2) for a recreation of that ruthless proponent of military power Grand Moff Tarkin, originally created by British actor Peter Cushing. This will make all original Star Wars fans happy, because it will be as if time has stood still, despite the majority now being in their 40’s and 50’s. 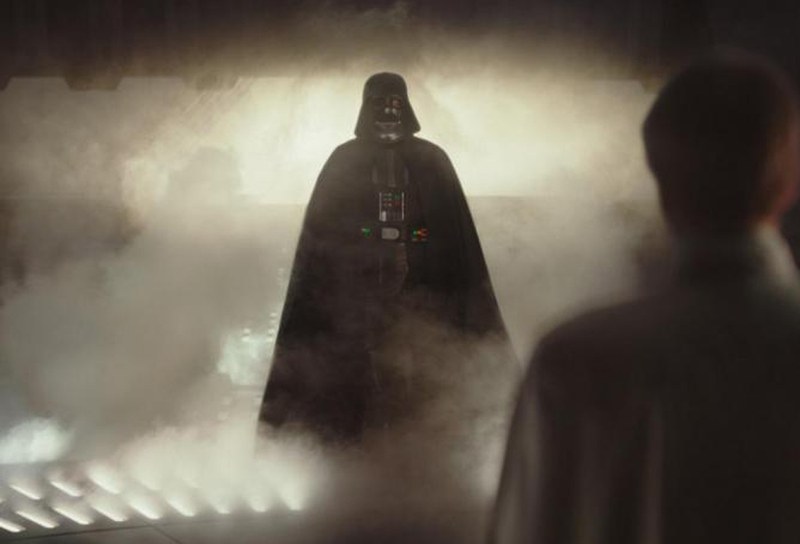 Darth Vader in Rogue One, TM & © Lucasfilm Ltd. Using the power of one, George Lucas during the four decades or so since the original trilogy has had an incalculable effect on inspiring children and their careers, as well as our society and its cultural development. I can vividly remember my three sons emerging into the light of day when it all began, completely gob smacked by what we had seen together for the first time. We have watched the films over and over during the years following, at first on video, then on DVD and finally enhanced for digital download. They never fail to engage and entertain us all, and while the Empire Strikes Back may have gained more critical approval, we still love the first one Episode IV best. 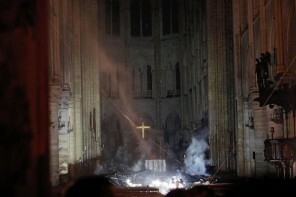 It was all about hope, which became our catch cry. Rogue One Poster its main characters reflected against the evil Death Star, TM & © Lucasfilm Ltd.
Jyn Erso (Felicity Jones) is an all-new character and in the opening scenes we see her being torn apart from her parents as a small child of about 7 or 8, but not before her mother puts a crystal on a ribbon around her neck. It’s the precious mineral that once powered the light sabres of Jedi warriors. She has been prepped well by her father who is a scientist and rebel sympathizer Galen Erso (Mads Mikkelsen). He knows its only a matter of time until the Empire finds his family and has taught her how to hide out in a place he has created, where she can wait quietly for his friend Saw Gerrara (Forest Whittaker) to arrive and rescue her. 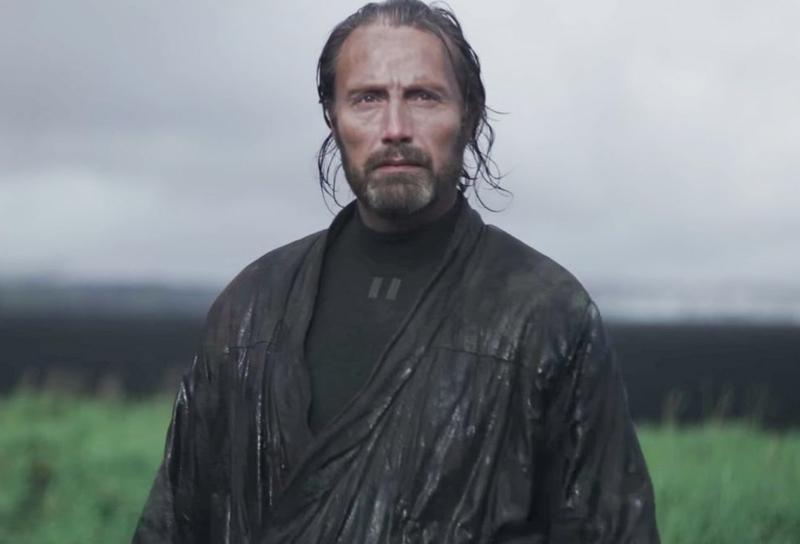 Mads Mikellssen as Galen Erso in Rogue One, TM & © Lucasfilm Ltd.
Jyn watches on from her hiding place as her mother is killed and her father Galen is marched away by Orson Krennic (Ben Mendelssohn), a member of the Imperial hierarchy with whom he appears to have had a history. 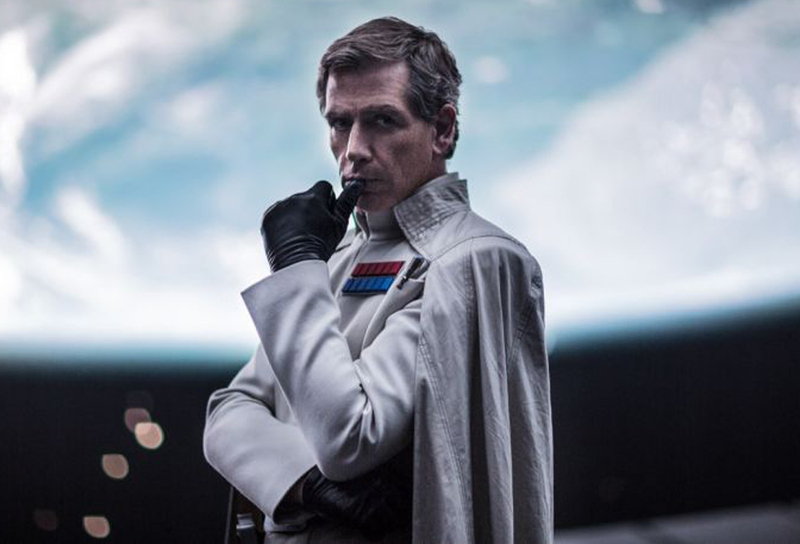 Ben Mendelsohn as Orson Krennic, TM & © Lucasfilm Ltd.
Mendelssohn as Orson Krennic, swans around with a cape as part of his uniform much like a Grand Vizier, all power and importance. We all know what happens when a giant ego gets in the way of common sense, so the cape becomes symbolic of what is to come – he has been warned to …’be careful not to choke on your aspirations’. 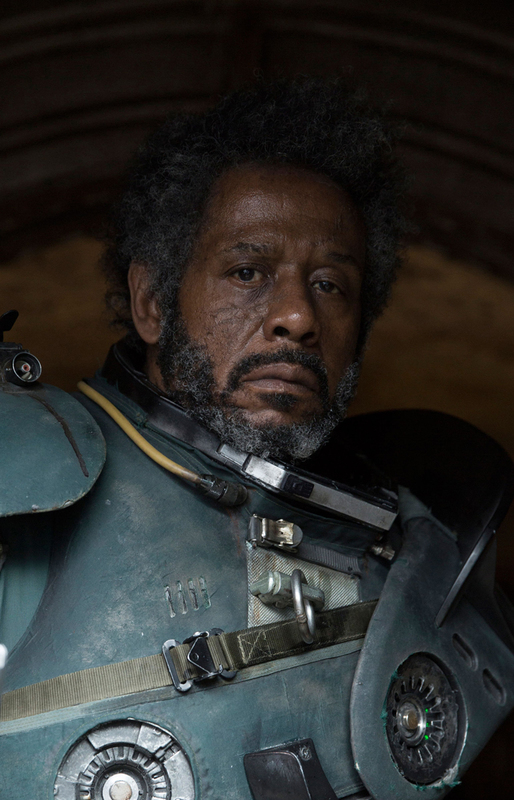 Saw Gerrera is, a battered veteran of the Clone Wars who raises Jyn until in turn, at least in her mind, she is also abandoned by him during a fight they are engaged in for the Rebel Alliance of which he is a breakaway zealot. She is 16 when this happens. Years later when they meet up again Saw tells her he thought it was time she stood on her own two feet, especially if they were to become meaningful. He’s fully aware that without a passion for the Rebel cause infused inside her, the contribution her father had hoped Jyn would make will not happen. It’s one of those tough parenting decisions often necessary for a child’s ultimate survival. Kindness in this cruel universe is in very short supply. With her father not around to protect her any more, Saw’s assessment was that Jyn needed to be hard conditioned, so she can deal quickly with shock and keep alive to face him and yet others again. And so now her experiences have made her more determined than ever before. Finding out where her father is and if he is still alive becomes a priority for Jyn. During her journey, which includes a group of rebels breaking her out of prison, she finds she has much to do. 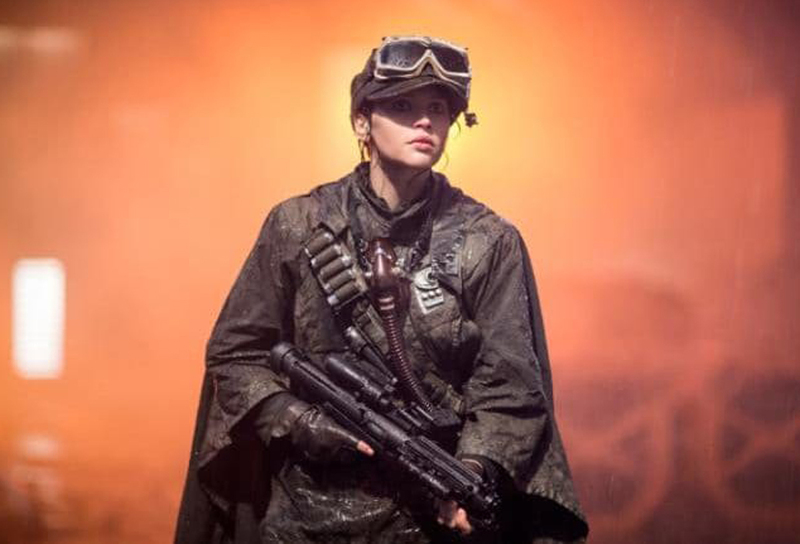 Felicity Jones character Jyn Erso is not an instant heroine, rather one who is brought into being by the intervention of the rag tag ensemble who eventually gather around her. 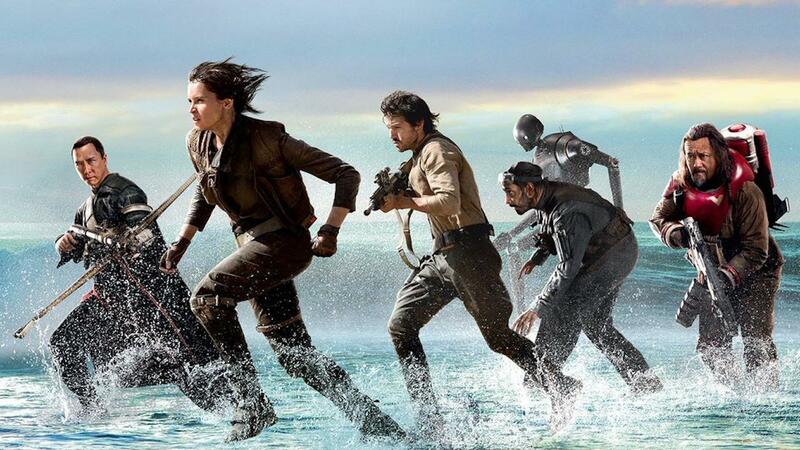 Many are led by Cassian Andor (Diego Luna) and his sassy wisecracking sidekick, a defector and an Imperial droid known as K-2SO (Alan Tudyk), who take her to meet the leaders of The Rebel Alliance. They offer to give her a fresh start if she will lead to them Saw Gerrera, whom they believe will be able to take them to her father. So she and Cassian head out together, but not before they clear up the fact she’s not the only one to have lost everyone and everything. He needs her to lose the chip on her shoulder. 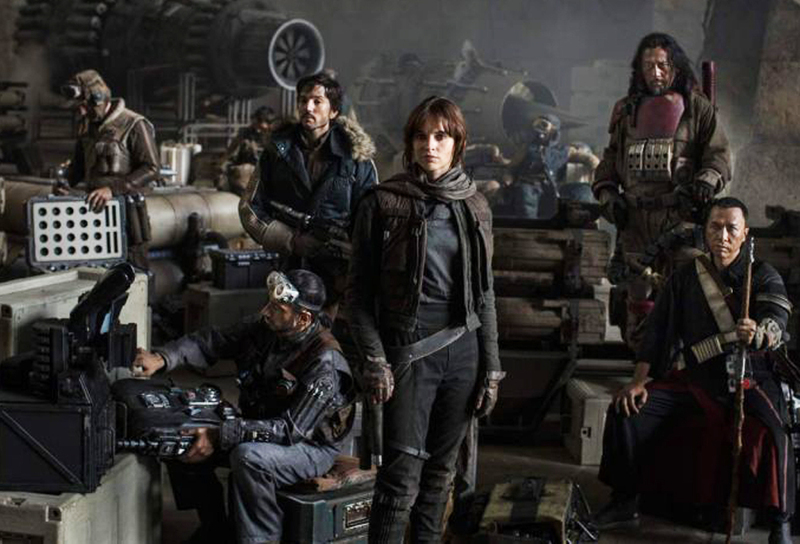 It is in the mining capital of Jedha an Imperial occupied moon that Jyn with her new best friends finds the last guardian of the Khyber Temple of Jedi Warriors. He’s a proponent of that ‘unseen force’ her father has been schooling her about ever since she was a child and someone she can look up to. He knows she is there because of the crystal around her neck. It is the mineral the Imperial miners and troops are there to retrieve, because instead of light sabres, it now powers the Death Star. 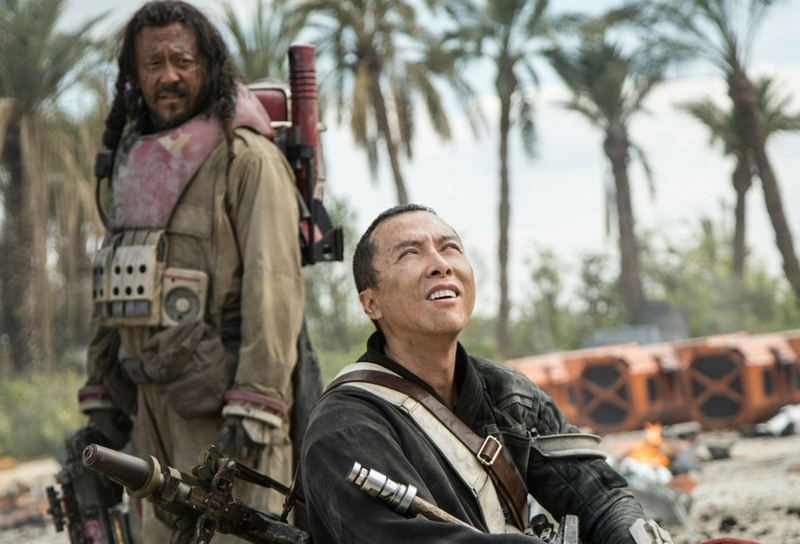 The Force is strong in the blind monk Chirrut Imwe (Donnie Yen) who has a longhaired Rambo like bodyguard, Baze Malbus (Wen jiang) and a winning smile. He also has more sophisticated martial art moves than you would have thought possible for a man whose eyes don’t work, plus a fighting style that leaves us only looking on in complete awe. They are all burning with the desire to see the Empire overturned, however on Jedha they become engaged in one fight they can’t win, so need to survive to fight another day. 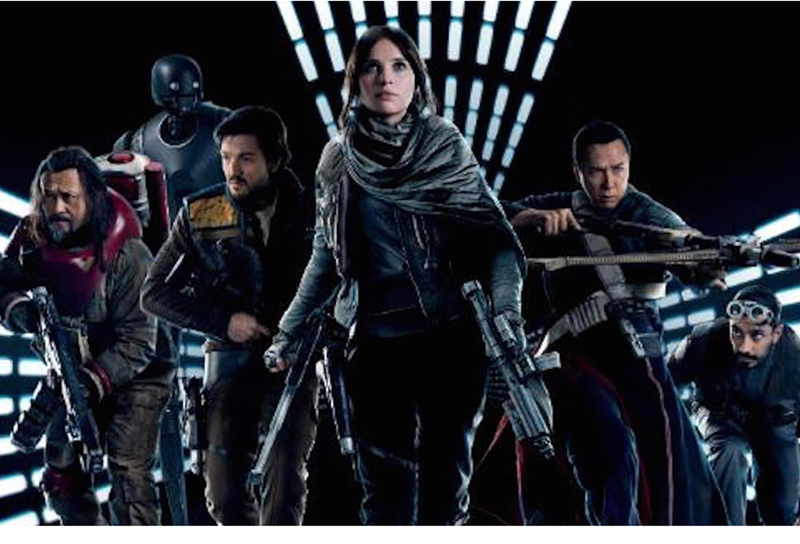 Captured they are marched away from the city to a fortress not too far away where they also meet the misunderstood captured Empire pilot a very anxious Bodhi Rook (Riz Ahmed), whom her father sent to alert the Rebel Alliance to what is going down. He has been intercepted by the rebels surrounding a suspicious Saw Gerrera, who is now but a shell of a man courtesy of his battle infused career. As Jyn picked up the crumbs along the trail to finding her father, she has discovered he has reached out to the Rebel Alliance through her. He sent her a hologram message via Rook, which Saw has intercepted. It tells her “I have placed a weakness in the system of the Death Star, a flaw so small they won’t find it, my Stardust” he says, using his pet name for her. He has deliberately built the flaw in the hope that his daughter can help the Rebel Alliance bring it down. But with the planet they are on under attack, she has no way to save it and her new allies. The fates interfere as they become their own small force of committed citizens, who oppose the ideology of the Empire and want to succeed against all odds. To do that Rook gathers all the courage of his convictions to join them. They escape the city of Jedha as it is dramatically destroyed by the Death Star. 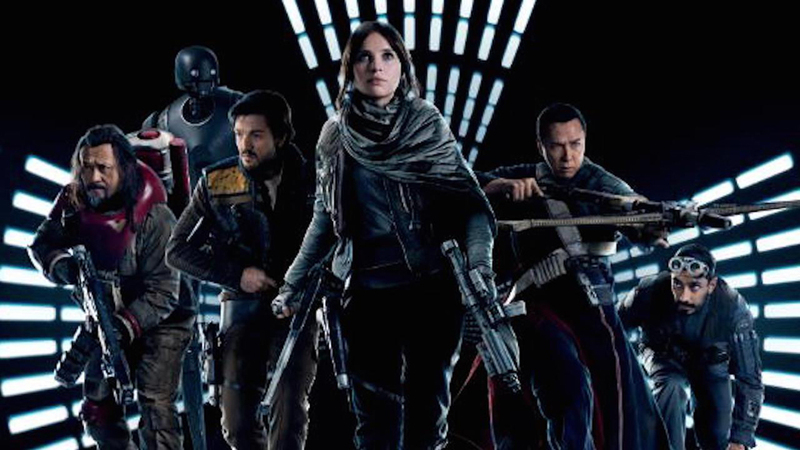 Defying the wishes of Rebel Alliance commanders who have been reduced to bickering and arguing among themselves, not wanting to make a decision to stand in unity, but rather walk away intending to surrender, Jyn, Cassian, K-2SO, Rook, Chirrut and Baze plus their committed band of supporters head out to where they know the plans are hidden. The word alliance is a sketchy term, one totally relevant in our own day and age when so many are overturned in the ‘heat of the moment’. The Rogue One message is that if something is worth fighting for, you don’t give up, especially when you are on the one yard line. ‘Rebellions are built on ‘hope’, but only as long as they have a brave leader like Jyn, who ultimately revives everyone’s flagging spirits, including that of the Rebel Alliance commanders. As Rebel Alliance leaders are dispersing they are contacted by Admiral Raddus of their Starship fleet. He has discovered Jyn’s small band have made a successful incursion onto Scarif, the heavily guarded Empire planet where the Death Star’s plans are kept in an archive guarded by a military installation and a gate in space and he’s lending his support and that of his fleet. They all come together to aid Jyn, Cassian and their followers, who make one man feel like ten, on their quest to secure the plans. The final battle sequence in space above the planet of Scarif is brilliant and spectacular to say the least. On the ground the odds are enormous against the small band who gave her their dying support and it is Jyn who transmits the plans before she and Cassian ascend together into the light as the Death Star destroys their own base on Scarif. 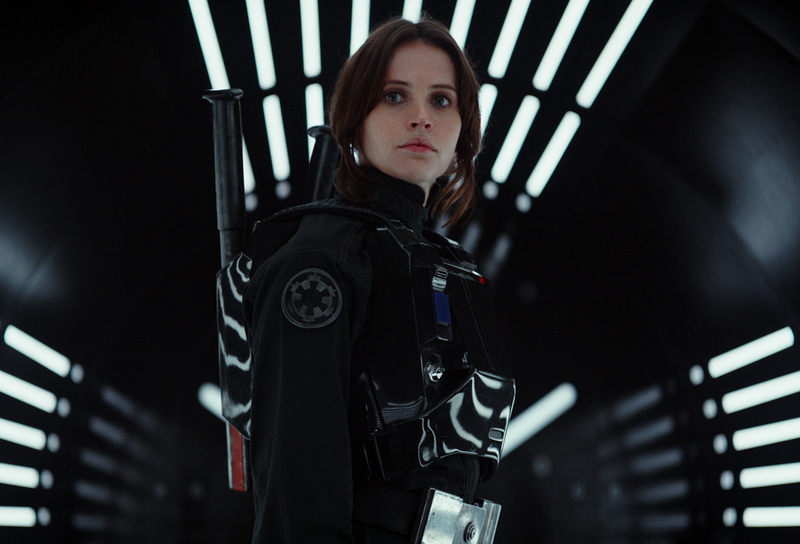 Rogue One is a great call sign for Jyn and her band and the movie has a new tone for a new age. Darth Vader is back more evil than ever before. If you look hard enough you will also see C3-PO and R2-D2 and Bail Organa (Jimmy Smits) before he heads off to the fatal planet of Alderon. Supreme Chancellor Mon Motha who appeared in the original 1983 Return of the Jedi is refashioned by Genevieve O’Reilly, who played her in Star Wars: Episode III, Revenge of the Sith in 2005 . It’s Organa who confirms to her before he leaves that he has called on his old Jedi Knight friend to help (Obi One) and yes, ‘she can be trusted’ (Leia). 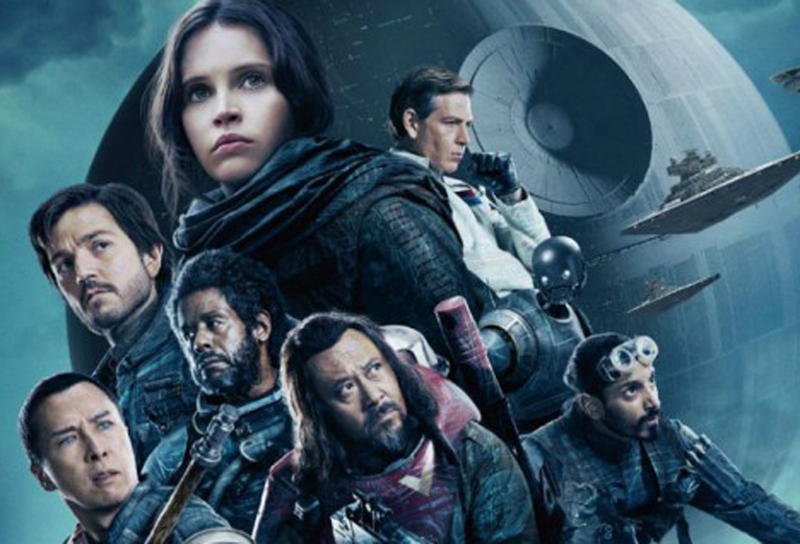 Rogue One is highlighted by the splendid music of composer Michael Giacchino and John Williams, who had defined each episode of the Star Wars stories until this all new prequel. They compliment each other in great style. Needless to say Rogue One left all us Star War tragics, like my eldest son, a friend and I who saw it together, happy. We knew what happened to the heroes who obtained the plans back in 1977, but nevertheless it was hard not to have a lump in my throat at the end. We were all heartened by the final scene, which is a wonderful touch. I will keep it a secret, while assuring you it will definitely please sci-fi and Star Wars fans everywhere. 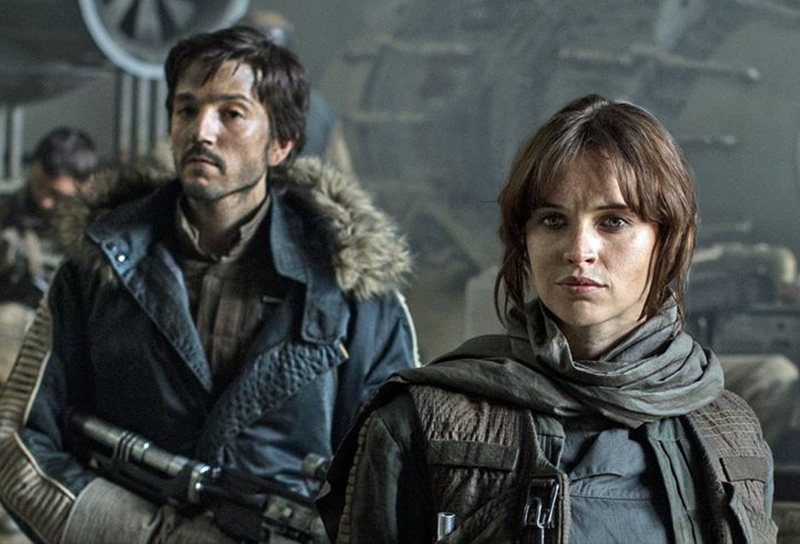 You will just have to see Rogue One: A Star Wars Story for yourself. It is pure escapism, creative, stunning, spectacular and wonderfully achieved. While it has no basis in reality whatsoever, it is about ordinary people doing extraordinary things – May the Force be with You!